Arrive Delhi in the morning, our representative will meet and assist you on arrival. 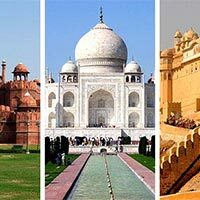 Directly proceed for half day Delhi Tour. Drive past Rashtrapati Bhavan, India Gate and parts of central Delhi. Also visit Himayun Tomb and Qutub Minar and in the afternoon proceed to Jaipur. Reach Jaipur in the evening and check into your hotel. Stay overnight at Jaipur hotel. Delhi stands on seven successive cities and is one of the oldest cities in the world. This history helps one appreciate the scale of the sprawling metropolis. It's a quintessential Indian city, marrying the ancient with the cosmopolitan. Revel in marvellous shopping, a treasure trove of architectural monuments, some of the swankiest restaurants in India and heavenly street food. Enjoy a hearty breakfast at the hotel and leave for Jaipur Tour. First visit the hilltop fortress at Amer. Ascend the imposing fort on a painted elephant. The Fort, originally built in the 16th century by Maharaja Man Singh encloses superb palaces and a beautiful temple in marble dedicated to the fearsome goddess Kali. In the afternoon, tour the old walled city of Jaipur. Founded by Maharaja Jai Singh II, this ‘pink city' is meticulously constructed on the lines of the Shilpa-Shastra, an ancient Hindu treatise on architecture. Visit the unique Jantar Mantar Observatory situated in the heart of the city. Built in the 1700's (A.D), it still looks futuristic. Nearby is the ornate Hawa Mahal (the palace of winds). The old City Palace & its museum display a rare fusion of Mughal and Hindu architecture, and house a rare collection of paintings, Rajasthani armory and costumes. Evening visit to Chokhi Dhani, an ethnic village resort (optional). The vitality of Rajasthani folk culture comes alive as children dance rhythmically to the loud tenor of folk songs sung by men and women, festooned in bright clothes. Gaily caparisoned camel, horses and bullock carts offer joy rides. Stay overnight at Jaipur hotel. Today in the morning after breakfast drive to Agra en-route visit Fatehpur Sikri (old deserted town of Mughal Dynasty). See the beautiful Jama Masjid / The Buland Darwaza, palace of Queen Jodha Bai, Birbal's (a Minister) Palace. Drive further and reach Agra in the evening. Check into your hotel and relax. Stay overnight at Agra hotel. Agra is famous as being home to one of the seven wonders of the world-the Taj Mahal. The architectural splendour of the mausoleums, the fort and the palaces is a vivid remainder of the capital in the 16th and early 17th centuries. 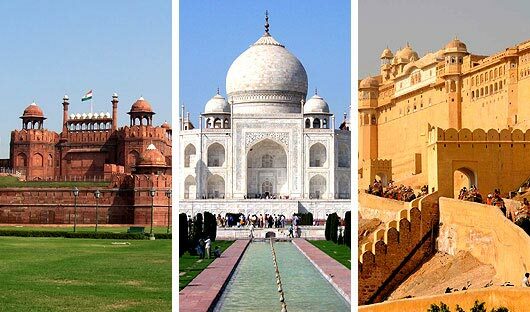 For any tourist his India Tour is incomplete without Taj Mahal Tour. In the morning visit Taj Mahal: symbol of eternal love. It was built by the Moghul Emperor Shahjehan in 1630 for his Queen Mumtaz Mahal to enshrine her mortal remains. After that visit Agra Fort containing the Pearl Mosque, the Halls of Public and Private Audience. Later in the day check out from hotel and depart for Delhi, directly proceed to air port or Railway station to board for final destination. Tour end with unforgettable sweet memories.